Mashed potatoes are certainly a common preparation that are present on all of our tables. Today we can buy them in a box, ready to be served in minutes. While I admire the ready-made mashed potatoes for their food technology, I’ve never bought one. If done in the traditional way, the recipe takes time, but I think at least sometimes it is important to taste preparations with original ingredients. I propose two additional ingredients that make up the decoration: pine nuts and ham. Peel the potatoes, add them to a pot of cold water, and bring to a boil and allow to cook. Add the pine nuts and diced ham to a non-stick pan and let them saute until crispy. Remove from the pan and place on a paper towel to remove excess fat. After about 30 minutes (from when the potatoes have started boiling) check to see if they are ready. If the fork penetrates the potato easily, they are cooked. Heat up a saucepan with milk. In a high-sided saucepan, add the butter and drop in the mashed potatoes using a potato ricer (using this tool will make the potatoes more creamy). Turn on the heat and stir with a wooden spoon until they developed into a thick cream. Gradually pour a ladle of milk, stirring constantly and vigorously, add the salt and sugar. When the puree reaches the desired consistency, turn off the burner. 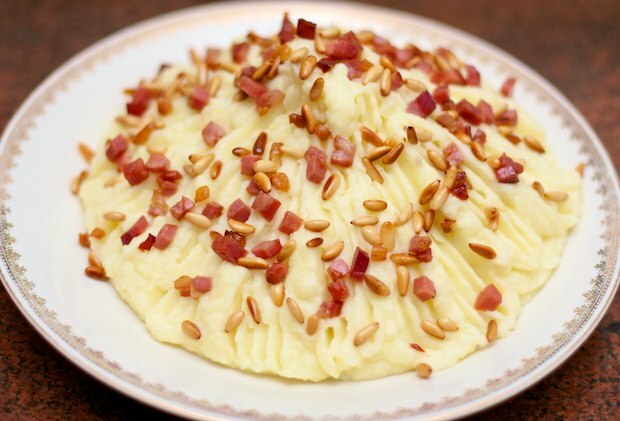 Form a mountain of mashed potatoes on a serving platter and evenly sprinkle the diced ham and pine nuts on top, then bring to the table. This puree is an ideal accompaniment to a roast or stew. Posted in Vegetables and tagged with Festive Mashed Potatoes, Purè delle Feste, Thanksgiving. RSS 2.0 feed.